Manipulation of the audience’s emotions can be subtle or blatantly obvious. Sometimes this is just to make the audience feel something and to enjoy the piece of entertainment. The films studied for this topic are all challenging and do provoke strong emotional responses in the audience. 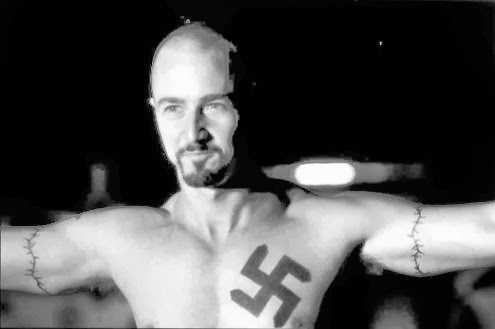 ‘American History X’ (AHX), ‘This is England’ (TIE) and ‘United 93’ (U93) all deal with the issue of racism and conflict between races. The films are constructed to manipulate the emotions of the viewers. Each film is categorised in the drama genre and as expected ends with the viewer encouraged to feel sadness. This is achieved through the narrative structure, the script, the performances of the actors and the construction of the film form (micro-elements). The soundtracks of all the films mentioned are particularly manipulative. The use of violins, a choir and piano music is designed to provoke strong feelings of sadness in the audience. The end of AHX uses slow motion running, close ups of crying characters and strongly emotive music to generate a feeling of sadness in the audience when a main character dies. Similarly the ending of U93 uses violin music and handheld cinematography to create a feeling of unbearable tension and sadness in the viewer and likewise, TIE has moments where the piano music is designed to evoke feelings of sympathy and sadness. However the films studied do not just use these manipulative techniques to create an emotional response. The films use these emotional responses to make very well considered points and challenge expectations that viewers will have of characters. In AHX, the protagonist Derek is a racist skinhead gang leader that kills a group of African Americans for attempting to steal his car. The film encourages hatred of Derek and disgust at his actions but also gives him a platform to air his shocking and controversial but very articulate viewpoints. The camera, the script and the narrative structure all identify Derek as the focus of the film but the viewer is encouraged to empathise most with his younger brother Danny. The death of Danny at the end of the film makes the audience sympathise with Derek. After he has been raped in prison by white inmates and helped to recovery and rehabilitation by his African-American school principal, Derek is changed and the viewer is challenged to change their feelings for him. The film uses Derek as a symbol by revealing that even the most hateful characters can find redemption and deserve a second chance. Similarly the killing of Danny by a young African American in the film suggests the never-ending cycle of hatred that is spawned from the actions of racist people. This is England makes an explicit link between racism, nationalism, war and politics. The use of real footage of Thatcher, the Falklands war and extreme right-wing rallies shows the context of the film and the real-life events that were occurring in the 80s when the film is set. Shaun’s father has been killed in the war and Combo uses his anger to mould the young boy into a racist, hateful skinhead. This makes a serious point about the dangers of sending men to war and training them to be racist in order that they can kill their ‘enemies’. The idea of unification and the diversity of 80s Britain is emphasised through much of the reggae/ska soundtrack and is juxtaposed with the hijacking of skinhead culture by those raised to hate. Thatcher is explicitly blamed by Combo for starting the war and much of Combo’s anger is directed at immigrants who he sees as the cause of Britain’s problems. United 93 is very manipulative of the audiences emotions using a recent real-life event and tear-jerking music to gain a response from viewers. However there are some considered points in the film that are subtly put across to the audience. For example, the film intercuts between the passengers of the plane praying for their lives and the terrorists also preying. This subtle use of editing implies the similarities between the God-fearing, religious Muslims and Christians. The titles on screen at the end of the film force home the message that this is a real-life event and that many real people lost their lives on September 11th 2001 and that the official story of what happened to United 93 is true and that rumours it was shot down are untrue. However originally the titles were to say ‘the war on terror had begun’ implying that the people on board were the first to fight against terror in the ongoing war between America and its enemies. This message was changed to avoid controversy however. The films listed here are not as mainstream as Hollywood blockbusters but were all very popular with critics and audiences. Their tackling of a serious issue like racial conflict suggests that they are going to make some serious and considered points. However as they are mainstream narrative films, they do this with interesting characters and dramatic plot elements to encourage audiences to have strong emotional responses. The films try to engage viewers by creating anger, sadness and even disgust but also give the viewers things to think about and a chance to challenge their own views and preconceptions, as well as extremist ideology.